A group of up to 145 pilot whales have died after becoming stranded on a beach on Stewart Island in New Zealand. The animals were discovered by a walker late on Saturday, strewn along the beach of Mason Bay. Authorities said half the whales had already died by then, while the other half were put down as it would have been too difficult to save them. In separate incidents, 12 pygmy whales and a sperm whale also beached in New Zealand over the weekend. 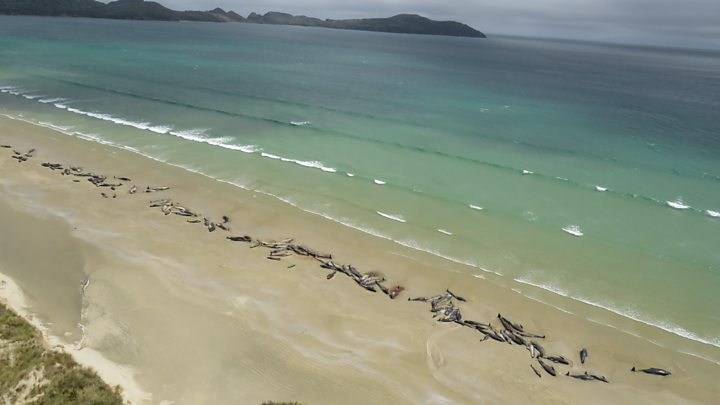 The pilot whales were beached in two pods about 2km (1.2 miles) apart on a remote beach on Rakiura or Stewart Island off the coast of South Island. “Sadly, the likelihood of being able to successfully re-float the remaining whales was extremely low,” Ren Leppens of the regional Department of Conservation (DOC) said in a statement. The DOC said in a statement that whale strandings are not uncommon in New Zealand and that there are about 85 incidents a year. In most cases though, it’s just a single animal that is beached, not a whole pod. It’s not fully known why whales or dolphins strand, the agency said. Possible reasons might be sickness, navigational errors, falling tides or being chased by a predator. Also over the weekend, 12 pygmy whales were found stranded at the northern tip of North Island. Four of them have died. There are hopes that the remaining eight can still be rescued and efforts are under way by local marine mammal charity Project Jonah. The group said it planned to re-float the whales on Tuesday and has asked for volunteers to help. On another North Island beach, a 15-metre sperm whale died on Saturday morning.